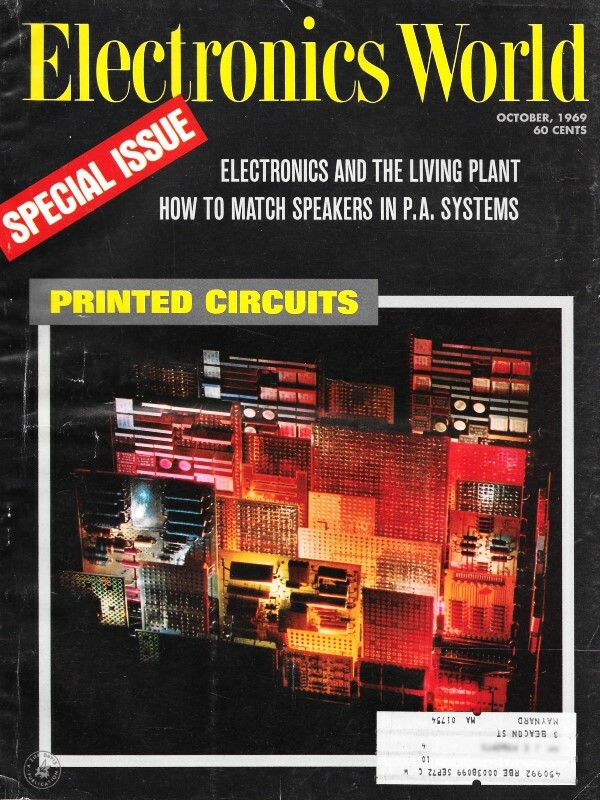 The October 1969 issue of Electronics World contained no fewer than nine separate articles on the relatively new technology of printed circuit boards (PCBs). Through the mid 1960s, many, if not most, electronic assemblies used all point-to-point wiring connections, or a majority of point-to-point with a minor circuit or two on a PCB. Multilayer PCBs were being routinely manufactured for defense and aerospace applications, but more than two or three layers was a rarity in an AM/FM radio, television, or smart appliance (just kidding about the last one). This "dry process" for PCBs, costing $6k ($41k in 2017 dollars), was pitched as a low cost method for manufacturing small volume boards. Compare that to today where dozens of companies will turn five or six relatively complex prototype PCBs in a day or two for $100. Prototype PC boards, in sizes up to 8 1/2 X 11 inches, are manufactured in less than 8 minutes using dry-process equipment available from Xerox. Recommended for prototype quantities, up to 200 boards may be made from a single drawing. The basic system, including a camera, processor, and vapor fuser, may be purchased for some $6,000. A rental plan recommended by Xerox enables the user to rent the equipment for $45 per month plus 10 cents for each manufactured board. In addition, approximately $200 has to be invested in accessories and $50 in expendable items. After 90 days the system may be purchased for $1,250. No special room temperature or light conditions are required for the installation of equipment. It is claimed that the simplicity of the equipment permits untrained personnel to master the process in one hour. A flow chart illustrating the sequence of steps in manufacturing a PC board is shown below. Initially, the operator slides a selenium-coated plate into the processor where it is made light-sensitive with a positive charge of electricity. The plate is reusable, enjoying long life if handled carefully. Protected by a light shield, it is then placed in the camera. The shield is withdrawn and the plate exposed to the artwork. Your original layout may be used for obtaining the image of the printed-circuit pattern. After exposure, the plate is returned to the processor and developed. Negatively charged black powder is cascaded over the plate, the powder adhering to the areas unexposed to light. The resulting image is transferred electrostatically to an intermediate tissue which has been positioned on the plate and inserted into the processor. The copper-clad laminate is then placed on a special transfer plate in the processor where the image on the intermediate tissue is transferred electrostatically to the copper surface. Following the transfer, the tissue is peeled away. In the final step before conventional etching, the black-powder image is fused to the copper surface of the laminate. This is accomplished in the vapor fuser which is an air-tight compartment containing a rack for inserting the laminate. Vapor emanating from a solution (Flo-Set) supplied by Xerox forms a permanent toned image of the layout on the copper. The preceding steps, from beginning to end, should take under 8 minutes for an experienced operator. It is possible to repeat the process and form another layout on the other side of the board, producing a two-sided PC board. Transferring the image on the first side does not, in any manner, affect the second side. A possible difficulty is registration. With proper care, satisfactory two-sided boards are realizable. The system is flexible. For example, the circuit and component sides of a board may be shown in one simplified view on an assembly drawing. The artwork is photographed with a white-dot pattern Craftint screen overlay (25 to an inch). The result is a full-sized screened copy of the artwork copied on the reverse side of a drawing form. Viewed from the front, the layout appears to be reverse reading. The draftsman can visually locate the placement of components from the terminal pads located on the reverse side of the drawing. Prints made from the drawing show details of each mounted component superimposed on the screened "ghost" circuit image.